Burning Skies – Cover Reveal! It’s here! 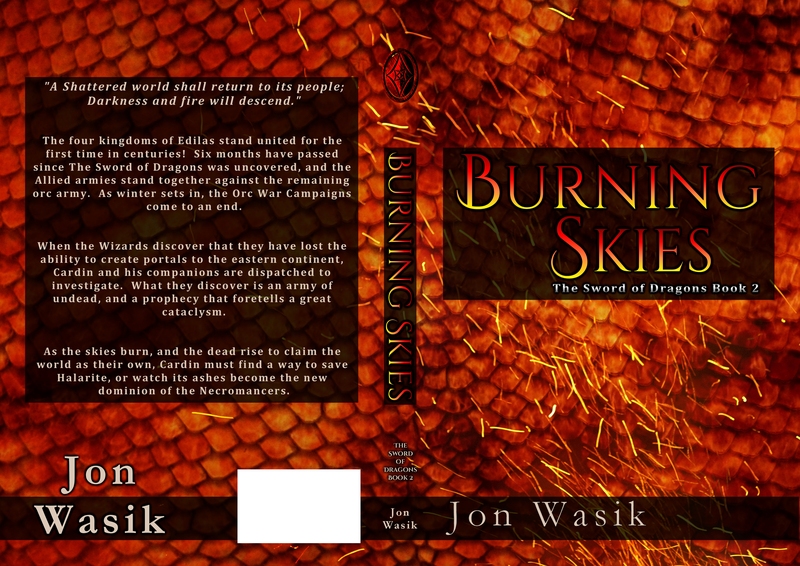 The final proof copy of Burning Skies has finally reached my doorstep, and I have to say, I fully approve :D If I weren’t so excited, I’d write some big build-up to the reveal, but I can’t hold it back anymore, so without further ado, I give you the cover for the next Sword of Dragons novel! I am beyond ecstatic, the cover turned out better than I could have ever hoped for :) In fact this picture hardly does it justice, it really looks sharp! It’s been an interesting road leading up to this cover. 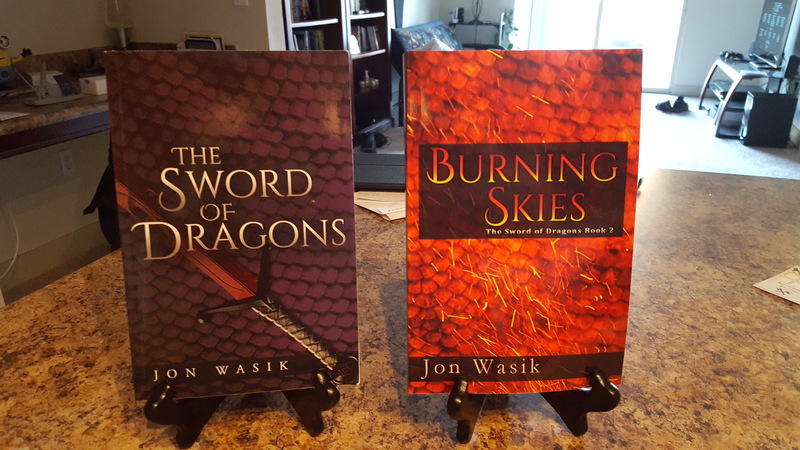 When I first started working on getting book 2 ready for publication, I originally intended to release it 6 months after The Sword of Dragons. The biggest part that held me back and forced me to postpone? I couldn’t afford to pay the cover artist for book 2’s cover, Christian Michael. I had intended to save up and hope to be able to afford it 1 year out. But then something occurred to me: I used to do graphic design for a hobby. Maybe I could take a crack at it. Not that I didn’t want Christian, he is after all a fantastic designer. But the cost of book 1’s cover is really what kept me in the red. In fact it’s only now, almost one year into book 1’s release, that I’ve finally made it into the black! I didn’t want to go back into the red financially. So I started playing around. 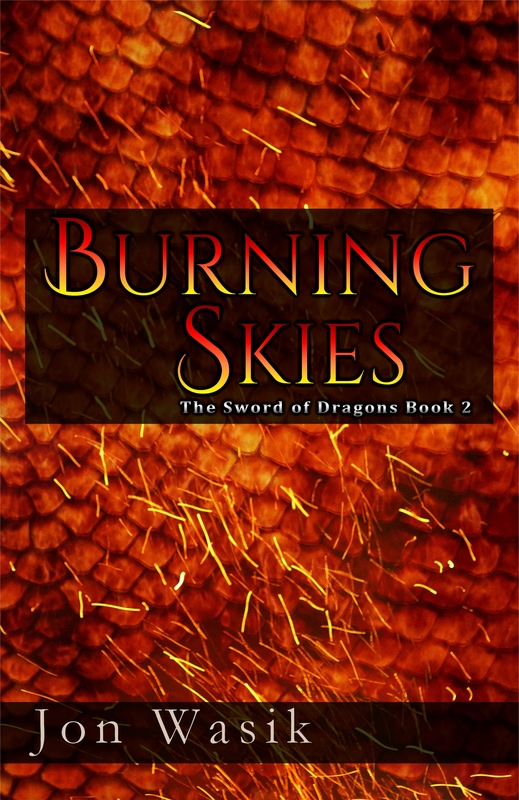 As some of you saw in a previous post, I had found amazing artwork that I loved and began to turn it into a cover for Burning Skies, while I waited for the artist to (hopefully) sell me the rights to use his artwork (with the hope that it would be inexpensive…) But alas, he declined to sell me the rights. Then a friend of mine reminded me that I had always intended to have simple, more symbolic covers for the first editions of the Sword of Dragons novels. And I had an idea. After pulling out Paint Shop Pro and experimenting over the course of several days, I had the first version of this cover. 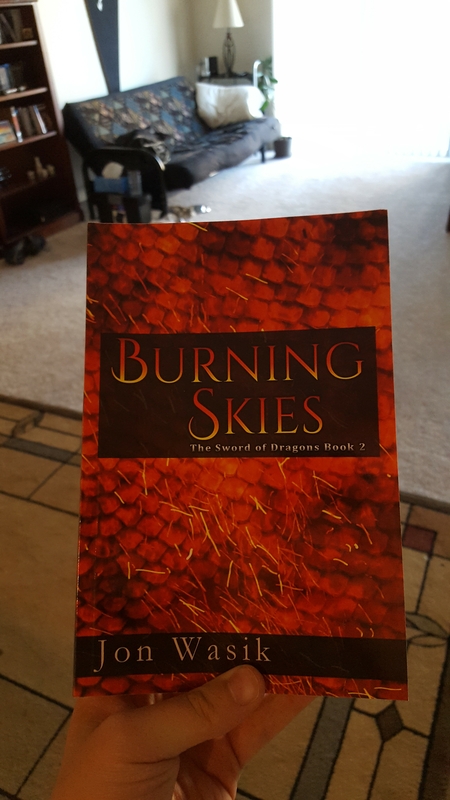 And thus was able to order my first proof copy of Burning Skies. Those who saw the first cover loved it, and I was mostly happy with it. I knew I had to tweak it some to help it line up with book 1’s cover, but…something else was missing. Something to really make the cover stand out. Initially I thought to add a central object, like the Sword in book 1’s cover. However, after much experimentation and failure, I was disheartened and resigned to leaving it as-is. I hope you all enjoy! We’re just over 3 weeks away from release day, so stay tuned for more exciting Burning Skies news! !